Cite this article as: Palistha Maharjan, "Relational Dialectics Theory," in Businesstopia, February 27, 2018, https://www.businesstopia.net/communication/relational-dialectics-theory. Relational dialectics theory is an interpersonal communication theory which explains communication patterns that arise between individuals when they maintain a relationship. The theory focuses on tensions and struggles in a relationship. These tensions could be within the relational partners or between the couple and the society. Before we move on to read more about this theory, let us be clear about the term dialectics. In communication, dialectics are competing states that are produced through dialogue. Relational dialectics can be of two types – internal and external. Internal dialectics can be understood as the tension between the relational partners while external dialectics can be understood as the tension between the couple and society. The relational dialectics (competing states) can be classified as follows. 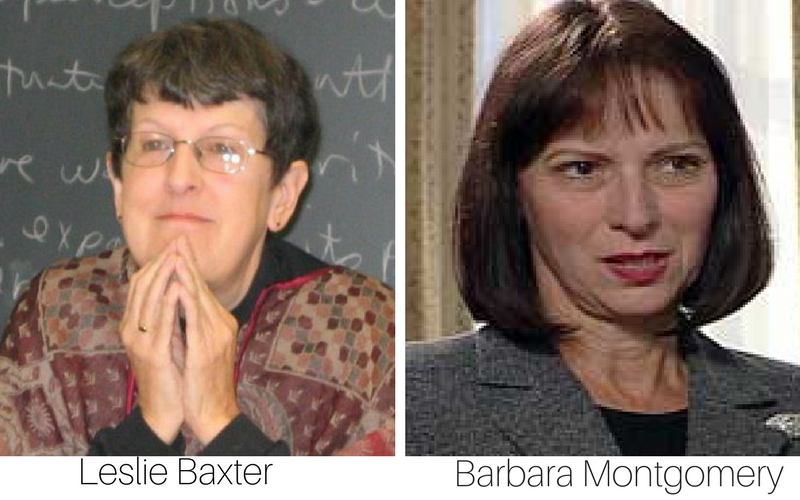 Relational dialectics theory was first proposed respectively by Leslie A. Baxter and Barbara M. Montgomery in 1988. They developed the theory to explain how communication creates and constantly changes close relationships. Baxter and Montgomery independently analyzed tensions inherent in romantic relationships and listed the contradictions voiced by the couples. Although in the initial phase, both Baxter and Montgomery worked separately, they soon realized that what they were doing was common. They then came together to co-author a book called Dialectical Approaches to Studying Personal Relationships in the 90s. When Baxter first began her research, she quickly gave up any hope of discovering scientific laws that neatly described the experiences of the people. It is because each individual is different from the other in one way or another. So when two individuals unite to form a relationship, the tensions they face are unique in nature. However, the theorists have proposed list assumptions and concepts that justifies relationship dynamics to a certain point. The relational dialectical theory is based on four major concepts and assumptions. Relational life is characterized by change. Contradiction is the fundamental fact of relational life. Communication is central to organizing and negotiating relational contradictions. Contradiction is one of the core concepts of relational dialectics theory. A contradiction is generated when two tendencies are interdependent, yet mutually negate one another. It can be easily understood from the above example. Joe and Hailie’s desire to stay close to each other and their need to maintain distance simultaneously are contradictions. Totality says that contradictions in a relationship are a unified whole and cannot be understood in isolation. In simpler language, it means that the contradictions are intrinsically related to each other and cannot be separated. For example: Joe and Hailie’s desire to stay close to each other will not be called a contradiction if their need to maintain distance does not exist at all. It takes both opposing tendencies to form a contradiction. Relationships are processual in nature. It means that relationships are not about a single event. Rather, they are about various social processes that are simultaneous and of recurring manner. For example: We see Joe and Hailie do not feel the same with each other all the time. They move between the periods when they want to spend more time with each other and when they want to be their own person. This movement between contrary phases can be understood as motion. Praxis focuses on the practical choices that human makes amidst the opposing needs. It contains the view that humans are choice makers and objects of their own actions. For example: Between the competing states of Joe and Hailie’s needs, they behave as per the situation demands, backed by their logical reasoning. How to manage Relational Dialectics? The founders of this theory have suggested eight methods by which individuals can manage dialectics in the relationship. These methods are briefly described below. Denial – Denial refers to the act of responding to only one side of the tension while ignoring the other side of tension. Disorientation – Individuals can manage relational dialectics by disorienting the relationship. This means the partners in a relationship can escape the tension by ending the relationship. Alternation – Alternation can be a good way of managing relational dialectics. In this approach, the partners alternately give attention to their tensions. Segmentation – It can be hectic for individuals to deal with all the tensions at once. So, they can choose to deal with one side of the tension at a time. Unlike denial, this approach is related with dealing with either all of the tensions in one area of life or with one kind of tension in all areas of life. Balance – In this approach, individuals compromise between two opposing forces. In other words, they maintain a balance between the situation while partially responding to different tensions. Integration – Integration might not be easy but a useful method of managing relational dialectics where an individual can integrate different tensions in his life to produce solutions that solve all tensions at once. Recalibration – Recalibrating is a process by which an individual reframes the whole tension in a way that it no longer stays in the form of a tension. Reaffirmation – Reaffirmation refers to the process of accepting the tension as a normal and healthy part of a relationship is also a way of managing relational dialectics. Leslie Baxter believes that this theory has certain limitations. She has mentioned the following three points as the major limitations of this work. Leslie claims that the theory is too distanced from the naturally occurring talk between relating parties and that the theory needs a firmer empirical base when applied to talk between relating parties. She believes that more future work needs to include multiple voices instead of focusing on the more popular research on the dialectics between two voices. She has stated that future research should focus on discourse through time, such as studying dialogue and how it transforms over a long period of time.